The Drop 10 Pounds Diet was created by the editor in chief of SELF magazine, Lucy Danzinger, to help you lose ten pounds or more. On this program you can see results in one week simply by incorporating more superfoods into your diet. It is a flexible plan that gives you lots of room for enjoying your favorite treats every day. Despite the title, this program focuses on healthy eating, rather than being simply a short-term diet for losing ten pounds. This approach helps you to naturally lose weight as you reduce your risk for conditions such as diabetes, heart disease and cancer. The author recognizes that diets fail when people have to give up the foods they love. So this plan is specifically designed to allow you to shed excess pounds without feeling deprived. The basic diet is based on 1400 calories a day divided into three meals and one snack. Every day you are allotted 200 additional “happy calories” bringing your total daily calorie intake to 1600 calories. You can use your “happy calories” on any food you like including chocolate, cake, potato chips, ice cream or pizza. You may choose to have a daily 200 calorie treat or accumulate up to four days of calories so you can have an 800 calorie splurge. This flexibility means you can adjust the program to suit your lifestyle or events like a birthday party or restaurant meal. Superfoods provide you with high-quality nutrition, which help to reduce cravings. For the best results you should include at least one superfood in every meal. Ideas are offered for fast and easy breakfasts, lunches, dinners and snacks. You can try something new at every meal or rotate your favorite recipes. For best results try to include all of the top ten superfoods in your meal plan. Chicken breast, turkey, salmon, shrimp, tuna, lean beef, pork, hummus, lentils, edamame, low-fat milk, yogurt, eggs, quinoa, broccoli, Brussels sprouts, lettuce, spinach, sweet potatoes, apples, blueberries, kiwi fruit, maple syrup, olive oil, chocolate, coffee. The program includes two types of “super workouts” that help you burn calories and boost your metabolism. These workouts alternate high-intensity bursts with slower paced activity. This method especially targets belly fat at a much faster rate than steady paced aerobic exercise. These exercises build muscle so that you burn more calories, even when you are resting. The Drop 10 Diet: Add to Your Plate to Lose the Weight retails at $26. Encourages consumption of a variety of unprocessed fresh foods. You can enjoy your favorite foods every day. Flexible plan that fits with your lifestyle. Includes five weeks of menus and recipes. Suitable for those who wish to drop 10 pounds. Encourages consumption of unhealthy foods. Calorie allowance may be too low for some individuals. The workouts may be too intense for those who are new to exercise. Some dieters may have difficulty limiting splurge foods to 200-calorie portions. Not written to include a male audience. 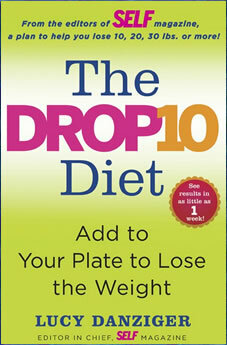 The Drop 10 Pounds Diet is a plan to help you lose weight without the need to give up your favorite foods. It offers a flexible meal plan that can be adapted to suit your lifestyle. This allows you to enjoy treats and meals at social events without breaking your diet or feeling deprived.